Upholstery staple guns are necessary to drive staples into upholstery woods, which are strong and hard. Choosing the right staple gun is an important part of every upholsterer's tool kit, and extremely helpful for do-it-yourself upholstery projects. Upholstery staple guns help you with important elements of the upholstery process. 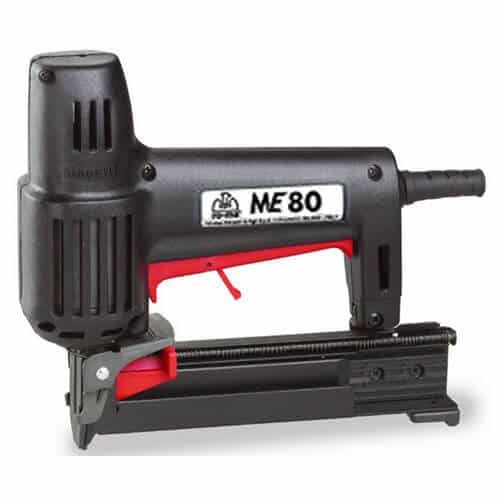 Fine wire electric upholstery staple gun for furniture upholstery, carpet laying and more. 22 gauge, 3/8" wide crown. Goes into hardwoods much better than hardware store staplers. Shoots C Series, 71 series, 3G, #7, .22gauge, 3/8" width crown staples. Lengths of 1/4", 3/8", 1/2", 9/16", and 5/8" length sold by us and most upholstery supply houses in North America. High resistance body in fiberglass reinforced resin. Extended nose. High quality case will protect your electric upholstery staple gun. Includes free box of 10,000 3/8"-length staples ($7.50 value). We recommend you also buy a box of 1/2 #7 staples if you are working on furniture with an outside back and arms as the thicker padding requires a longer staple to sink into the wood through all the padding. 110 volts for North America only. If you do mostly furniture upholstery get the #7 gun. The #8 staple gun gets a little bit bigger bite on vinyl. User Quote: "I use this easy-to-hold electric upholstery staple gun on all DIY projects that involve fabric, foam and batting. It may be lightweight but it can shoot into any material." Casey Noble. HGTV Magazine (12/12 issue). Fine wire staple gun for boat and booth upholstery, carpet laying, valance and paint canvas frame covering. 1/2" (width)crown 20 or 21 gauge staples. Shoots 1/4", 3/8", 1/2", 5/8" length #8 (BEA 80/380, , Atro 8, JK680, Spotnails 80 (980xx series), Hauboldf 800, Rainco 8, PrebenaA, Fasco EB80xx) staples carried by us and most upholstery supply houses in North America. High resistance body in fiberglass reinforced resin. Double insulated. Extended nose.Quality case, padded, room to carry staple boxes. 110 volts for North America only. Includes free box of 5,000 3/8"-length staples. If you do mostly furniture upholstery get the #7 gun. The #8 staple gets a little bit bigger bite on vinyl. We have a very expensive, oversized custom, leather couch that was looking rather droopy after 15+ years of sitting, sleeping, kids, dogs...etc. Not ready to replace it any time soon. New foam, new batting and a little elbow work from stuffing and we have a new looking couch. It is amazing the difference in just having new foam and padding. It was like giving the couch a facelift...all the wrinkles came right out.